Spotlight Education week continues with the season premiere of Craft in America. TEACHERS highlights artists committed to sharing the skills and passion for craft with students of all ages. Featuring Navajo weavers Barbara Teller Ornelas and Lynda Teller Pete at Idyllwild Arts, glass artist Mark Mitsuda at Punahou School, glass artist Therman Statom, and ceramic artist Linda Sikora at Alfred University School of Art and Design. WSKG’s Crystal Sarakas interviewed Linda Sikora for our Artist Cafe program. Individuals should contact Alfred University to learn about professional studies in Visual Art and for more information about Ceramic art. 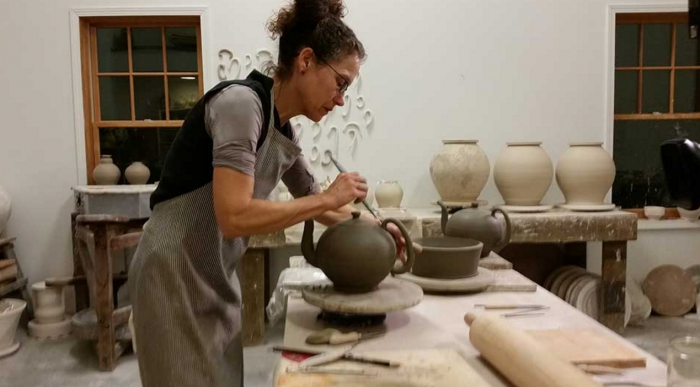 To see some of the best functional ceramics in the country locally, attend the national ceramics Flower City Pottery Invitational in Rochester, NY on October 14, 15, and 16, 2016. This is held at the Genesee Center for the Arts and Education. Teaching in the visual arts or at all would not be possible without the dedication of Universities who support professional art programs and art centers such as Genesee who are dedicated to bringing art into their communities. Craft in America: TEACHERS premieres on WSKG TV on Thursday, September 15, 2016 at 8:00pm.